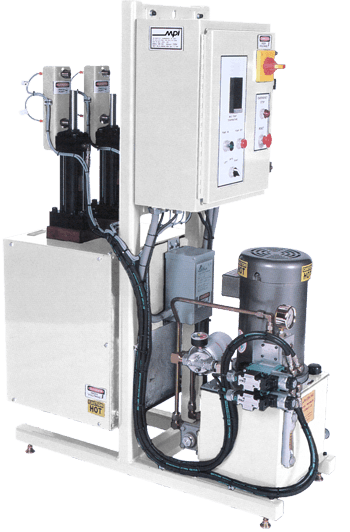 The MPI 96 series wax pumps are available for direct connection to your wax transfer system. It can be supplied for a low-pressure (pneumatic) or high-pressure (hydraulic) transfer systems. Pneumatic Pump, 200 PSI (14 bar) – ideal for closed loop or deadhead wax transfer. Two pumps alternate for continuous wax flow. Single-acting design eliminates wax rod seals, the highest point of wear on common double acting pumps. Check valves are hardened metal-to-metal for long life. MPI’s design team can supply a wax transfer solution suited to your specific application. Systems can be supplied from individual wax melters at each machine being fed by a central vacuum transfer system to rigid central wax transfer systems. Contact our sales department for more information.